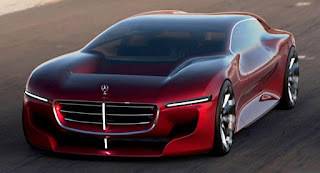 Pictured here is a concept design made by Roman Egorov, an automotive designer for Citroën (France). AutoNewsMag made an interesting profile of him including his previous internship experience at BMW and a current pursuit of his master's degree. The design for this elusive limo concept is only a part of his thesis with support from the Mercedes-Benz company. Accordingly, his idea was to design a traditional three-box limousine with an aerodynamic profile, drawing inspiration from motorsports. The design depicted here is primarily intended to deliver a seamless flow of air from the front grille through the hood to the rear and as well over the glass roof for a more aerodynamic driving. Underbody aerodynamics appear to play a significant role as well in keeping the airflow smooth and uninterrupted as well.